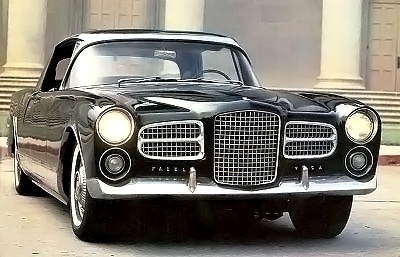 Appearing in 1959 was Daninos' first production Facel Vega four-door, based on the HK-500 platform but built on a 20-inch longer wheelbase. Its name was the Facel Vega Excellence four-door. A hardtop sedan sans B-pillars; it was novel in-having center-opening doors that latched on only two small lugs built into the sills. There is a debate over the merits of this arrangement. Some say the long, heavy, pillarless structure tended to flex, with embarrassing results for door alignment. Full pillarless construction on a long, chassis gave the Excellence a lot of body flex, according to some. Others say there's none. Others insist that there was no flex at all. Perhaps it is significant that Ford studied the Excellence and elected to use a semi-pillar type of construction for its Lincoln Continental sedan and convertible sedan, introduced for 1961. Despite being more than two feet longer than the HK-500, the Excellence was small by American standards at 206.5 inches long overall, though its 125-inch wheelbase made it comparable to U.S. full-size models. The impression inside was of a standard Facel Vega, with the same dummy-walnut dash, plentiful gauges, and aromatic leather upholstery. But the Excellence also provided a complete make-up kit for milady. Mounted on the back of the center armrest, it contained a chrome-handled brush and comb plus two perfume bottles. The latter were not filled, no doubt just an oversight. Facel Excellence doors latched on small built-in sill lugs. Priced at a towering $12,800, the Excellence could hardly be expected to sell in hefty quantity, and it didn't. Production was just 60, 62, and 34 units for 1960, 1961, and 1962, respectively. Even so, it received a lot of good press. Comparisons were usually made with Cadillac's Eldorado Brougham -- quite apt, that -- as well as the Rolls-Royce Silver Cloud and Mercedes-Benz 300d, though the Excellence had the legs of any of them. While the contemporary Chrysler 300F was superior in speed and acceleration -- it had 413 cid to the Facel's 383 -- it lacked the French car's outstanding finish and more restrained styling. Later, the Excellence came in for disc brakes and, following the American trend, less pronounced tailfins. It cost the world -- particularly with optional power brakes and steering, air conditioning, power windows, and what-not -- but low sales were not necessarily a handicap in this rarified price sector. A beautifully maintained Excellence shows off the model's formal front and long, low profile. The Excellence nearly spun off one very interesting derivative: a revival of the grand luxe Packard. Proposed by a New York conglomerate in 1959, it was, of course, nothing more than a piece of badge engineering, with Packard nameplates and emblems, "ox-yoke" radiator and pelican mascot, and red-painted wheel hubs (the Facel's already had the required hexagonal shape). The idea was pitched simultaneously to Daninos and the Studebaker-Packard board and envisioned a "caretaker" operation under the Packard name. The cars were to be sold only through the more "exclusive" S-P dealers at an anticipated price of about $15,000. Daninos was agreeable, and S-P president Harold Churchill, a traditionalist and a car lover, was allegedly delighted. The project actually got as far as the planning stage when opposition arose from Daimler-Benz, which was then marketing its Mercedes cars in North America through S-P and didn't take kindly to the notion of an "in-house" French competitor by any name. Churchill, realizing that the Facel-Packard would sell in much smaller quantity than the Mercedes, shelved the proposal. It was probably as close as S-P ever came to resurrecting the big luxury Packard after 1956. On the next page, we consider the Facel Vega V-8.